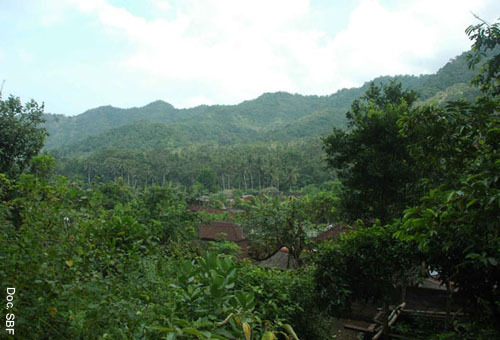 Tenganan, a village in East Bali, was established over a thousand years ago. The Tengananese are known as Bali Aga, a term that most perceives as the native people of Bali although the factual meaning of the word “Aga” is still debatable. Despite the controversy, the Tenganan people possess and practice a set of system that bores various manifestations known to the world, and among them are gringsing, gamelan selonding and gambang. 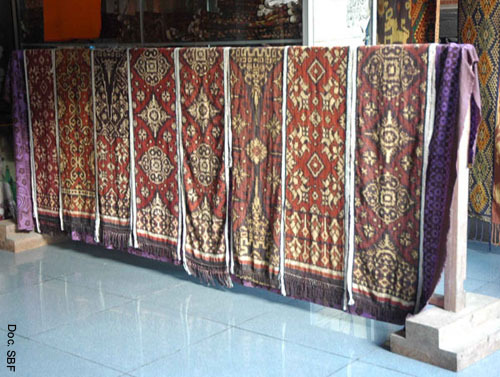 The sacred fabric Gringsing – literally means disease and/or evil repellent – is an artistic “gift” from the God Indra and being handed down for generations exclusively to the women. Gringsing is presented in a unique weaving and a sophisticated coloring techniques using natural dye. The weaving is a complicated double-tied technique that requires precision and skills that may take fifteen years to master. Gringsing is quite central to the life of the Tenganan people; even the formal version of the village’s name Tenganan Pegringsingan carries the meaning of a village that produces gringsing. It’s only natural that gringsing has made Tenganan known to the world. To members of Tenganan Village, the realm of Gods and their ancestors is a sacred territory manifested in their rituals and ceremonies that underlie the gringsing tradition. This is the very reason why the use of gringsing is restricted to certain occasions and rules. Such enduring respect, along with their long-practiced inheritance mechanism, evidently has preserved most of the antique gringsing. Equally important in safeguarding gringsing is the role of the village chief in sustaining the related rules and practice. The aim of safeguarding the gringsing authenticity is driven by their faith in Gods, and respect to the ancestors. This is why gringsing is intended only for spiritually-related activities while its functions include representing both their history and cultural identity. Girls (daha), boys (truna) to adults and the elders, are obliged to wear gringsing in various ceremonies, as a symbol of their devotion to the gods as well as respect to their ancestors. The authenticity and the artistry of gringsing are the ultimate achievement of its aesthetics since they are the interpretations of their religion, living, and natural surroundings. The artistry descended into 20 types of different gringsing, yet the principle about the life values within the society remains the same. The life values are being visualized into many symbols, with repetitive and geometric pattern. Pattern itself can be elaborated into motifs, colors, size and shapes. Principally, the motifs of gringsing are the artistic abstraction of the surrounding environment. These various motifs consist of: 1] Tenganan’s residential area in the form of squares with bows in each sides; 2] Floral patterns which being symmetrically cleaved such as Chrysolite flower and vegetable fruits such as Paré (bitter melon or momordica charantia) and eggplant; 3] The balance of life concept presented in a form of cross signs, stars, and sun as a macrocosm; 4) Means of protection concept is symbolized with dog fangs, barong (lion-like King of Good Spirits in Bali’s mythology) teeth, and scorpions; and 5) A form of wayang (puppet) that refers to the epic of Ramayana. Any of all the three directions—longitudinal, widen and diagonal—is a repetition of all motifs’ directions regardless of what size the gringsing is. All forms of motifs are geometric as seen from how they cross the same color of fabrics between the directions of both its length and width. 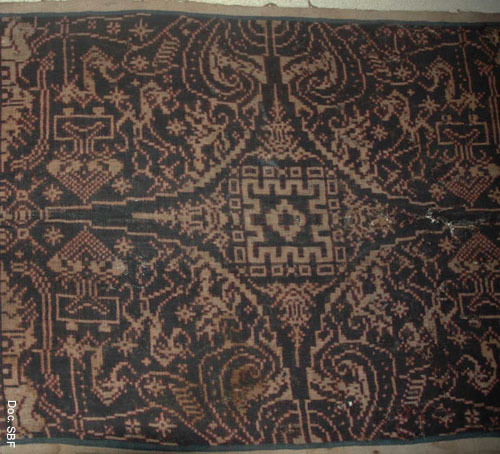 The motifs can be categorized into two groups; first is the dual-motif mix such as batun tuung, cecempakan and wayang mixed with cemplong; tri-motif mix such as dinding ai, dinding sigading, teteledan, kelompok lubeng, sanan empeg and perembon. The Tengananese acknowledges the authority of their great Gods such as Brahma, Vishnu and Shiva who are represented in three different colors: white/yellow, red, and black. This is the reason behind the use of these three natural colors in every gringsing they make, and such usage is called Barak. In certain cases, the three basic colors may not “visible” to the eyes. In the case of gringsing wayang kebo and gringsing putri for example, there are only white/yellow and black colors found. The color of red is actually there, but it is processed so that it appears as black. So, in principle, the tri-color mix is still applied. Albeit it involves the three colors, this type of usage can no longer be called Barak; it is named Selem. The reason for using only “two” colors in this matter is to surmount the complexity of composition resulted from dense small motifs. Application of three colors would make it impossible to spread them evenly. Each color, up to the present, is still made out of vegetation native to the village; white/ yellow is processed through the refinement of ripe hazelnuts, red is produced from the bark extract of Tibah tree, while black is originated from the extract of Taum leaves. As for the size, Gringsing has five different ones such as petang dasa, kebo, putri, patlikur and sabuk; each is subject to various procedures and usages during the religious rituals, and other ceremonies like hair-cutting, wedding, and when attending other villages’ ceremonies. In gringsing lubeng shows the village borders are guarded by four scorpions on each side, the stars show the artistry of the God Indra being revealed to the women of Tenganan. Gringsing has two types of forms; cylindrical, worn only by men, and loose-sheet, worn by men and women. The only difference between these two types is the size. The complex patterns found in gringsing is the result of not only the unique way of symbolizing life, but also the required geometrical precision. 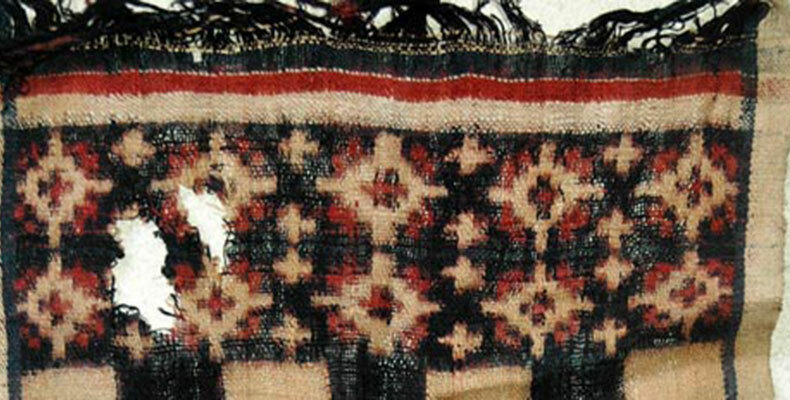 The binding determines the accuracy of the crosses, while weaving determines how well the motifs are structured. All types of gringsing mentioned above are made by each family in the village. Wearing gringsing in religious ceremonies defines the integration among the people and their Gods and ancestors. At the same time, gringsing also symbolizes life cycle that covers birth, childhood, adulthood, marriage, death, and reincarnation. Bali has undertaken transformations in the last 30 years of its development, with tourism as the main economic engine. Such changes implicate the way people perceive and practice the interrelation between culture and economy. Cultural manifestation is now seen not only as the outcome of the set of systems within a culture, but also as the production means to make a living*. In facing this “new” reality, gringsing seems to struggle to uphold its cultural values and functions. The strong presence of tourism somehow adds the supply and demand perspective to the cultural perspective of gringsing making. In the past three decades, gringsing produced by the Tengananese has exceeded the amount needed for ceremony purposes. The production is centered in two areas: Banjar Tengah and Banjar Kangin, the arrival points of incoming tourists. In theses two places alone, gringsing is produced by 40 out of 140 families. This high production (due to meeting the market demands) impacts the required volume of raw materials. Today, most of the raw materials are imported from other villages, and even another island. In this condition, gringsing makers have to buy the raw materials with the price that they are unable to control. Rivet cotton and Tibah roots are among the raw materials that they need to import. The provision of Taum leaves faces a different problem; it is prohibited to plant new seeds since the trees disrupt other plants’ productivity as it is regulated in the Awig-Awig (written custom law). Moreover, these are not the only things that are dependents of outsiders; some produce that were once self-produced are now bought from outside. These raw materials may actually be self-produced if the community exercises certain approaches. The limited area, for instance, may be divided into several designated zones. If the area for the raw materials is still not sufficient, then finding the suitable agro-technology may be the answer. To be self-reliant is fundamental in any economy; it guarantees not only the supply of basic needs, but also the price control to be on your side. The cultivated land area is about 80% of the overall area of 900 ha, which treated as a source of living that is maintained since 1000 years ago. The purpose or motivation behind the making of gringsing is also challenged. Motivation that was once purely spiritual is now “imposed” by meeting the sales target. Regardless of whether this is a good thing or not, this situation will (in certain cases already have) change how the Tengananese (particularly the young) view and value their gringsing. There is also a noticeable change on the supply side. Gringsing used to be produced by families for cultural and spiritual purposes. Members of the families shared the surplus of the income if there were any. Today, gringsing may be made by hired workers, a condition subject to wage system. As a result, the intra-relation among members within a family, and interrelations among families in the village have changed. Let us hope that these changes will enrich the culture of Tenganan instead of permanently damage it. In the early 80s, government of Indonesia positioned Tourism as one of the main engines in the national economic development. Bali, with its long-standing international popularity, naturally leads the tourism campaign. All potential areas in Bali then were “developed” and promoted as tourist destinations, including Tenganan Village. Gringsing was indeed immediately treated as the most feasible income-generating tool for Tenganan. Transfer of employment* then began to take place. More and more members of the village, since then, have left their farming to concentrate on craft-makings. As mentioned briefly previously, this condition has caused the Tengananese to be dependent on others when it comes to not only gringsing making, but also their basic diets. Tourism is not meant as a bad thing, but its practices often solely focus on wealth (actually money) creation, and completely neglect other equally or more important aspects*. The funny thing is that when the balance of spiritual-material living is disrupted, no one steps up, claims the responsibility and then corrects it. Tourists spend their time in Tenganan for two to three hours long. They are generally considered to be potential buyers of gringsing. The spiritual leader of Tenganan said,” Gringsing does not need to be patented. The purpose of producing it is for the ceremonies, and ceremonies are meaningless without it.” How should we take this statement? In the past twenty years or so, intellectual property has shifted from a symbol of respect to the creator or inventor to a tradable commodity*. Patent then has become the vehicle to ensure both the income and profits go to the creator. Motivation behind most of creations today, including cultural manifestations, is to make money*. Most individuals and many nations are now in the race (if not war) of claiming who hold the rights. Individuals today can even claim the rights over a community or even a nation that has exercised the pattern, motif, design, or technology of things for hundreds or thousands of years. Countries like Indonesia and Malaysia are often in dispute with regards to cultural heritage. UNESCO’s Heritage List, although carefully issued, adds to the complication of the matter. Gringsing sold in art shops is the same gringsing used for the ceremonies. The price ranges from one million to 25 million rupiah. The statement above is derived from a cultural perspective, and gringsing should keep it as its core perspective. If not, then gringsing will be valued a tradable product, just like any other manufactured products. The problem that may arise if gringsing is not patented, someone or some nation can claim the intellectual property right of it. This is possible since historical facts and long-standing cultural practices are not recognized as today’s legitimate proof*. So, a thousand-year of work may no longer be claimed simply because someone has managed to obtain a piece of paper saying that it is his or hers. C’est las vie?